The trail starts out on an old roadbed that runs up Lee Creek. The trail crosses Lee Creek then climbs sharply up hill on another old roadbed. After a short 1/2 mile climb the singletrack begins. The trail switchbacks down the hill then skirts along a bluff above the river. The trail continues back down Lee Creek, passes through the "gravity cavity", and crosses Lee Creek again before bringing you back smiling to the campground where you started. Review: Rode this while on a trip to Fayetteville Memorial Day Sunday 2018. Once I found the trail it started out pretty well. Had technical sections, good climbing, pretty good downhills. Lots of rocks and roots made it fun and challenging. NEEDS NEW SIGNAGE AT TRAIL INTERSECTIONS!! Presented as 5 mile loop but my MapMyRide came it at just under 10 miles and I know I looped various trails a couple times. Very hot and humid that weekend ... take lots of water ... and possibly a friend. Review: Rode May 22, 2015. I've always wanted to check this place out. There was one photo on here and little information. I finally checked it out, so here it is. Fossil Flats is much like many other trails in the mountains of Arkansas given the terrian, but this one is a real gem. Not too many miles, I did a loop around 6 miles. You can get more and maps are available at the visitor's center. You get into some just natural lush backcountry singletrack, consisting of streams, nice dirt, rocks, and a river. On three occasions I took off my shoes tied them to the camel back and crossed the river with my bike on my shoulders. The trail snakes across the river three times for sure. This was truly a great ride and I can't wait to go back. There is tent camping right off the trailhead with a nice bathroom and shower facility. This is one of the most scenic diverse trails that I have ridden given it's shorter distance. I can't remember, however I think you may get close to 10 miles given your loop, but don't hold me to that. One of the rangers that works the park is a mountain/road biker, super nice guy (wish I remembered his name) but he had a lot of helpful info. If you're in the area or are passing through, you should stop by. 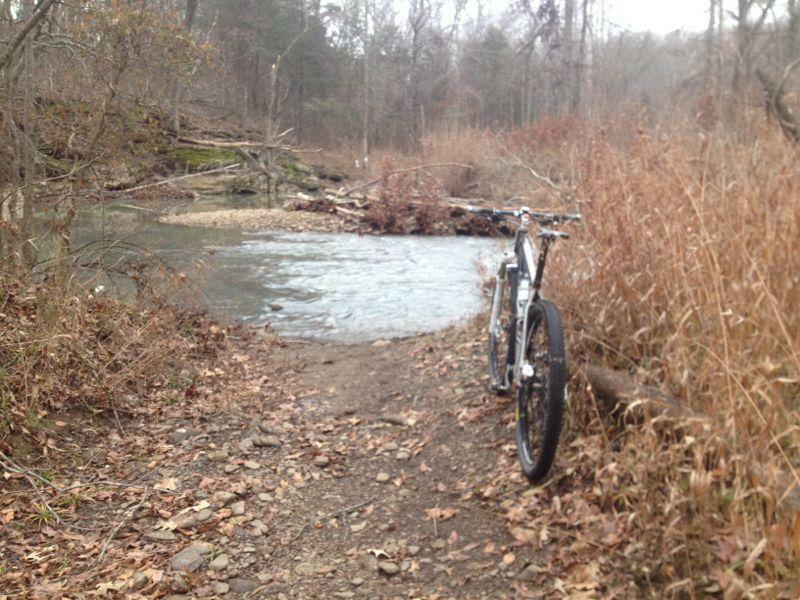 Review: We rode at Devil's Den for the first time in many years. Last time we rode through seemingly permanent mudholes and poorly layed out, very rough singletrack. We were either on the wrong trail or many improvements have been made over the years because we found Fossil Flats to be an enjoyable run. Rode the whole thing clockwise. Thought the "dreaded" climb on Racer's Hill was well constructed and the downhill was just as fun. Had a hard time finding the right trail just past the walk in campground (signs were confusing) but fortunately another rider came along and showed us the correct way. We will recommend this trail from now on. Review: Only 1 trail was open to mountain biking upon our arrival. It was a long climb with a fun and quick decent toward the end and crossing back over a stream into the campgrounds. Fun, beginner friendly, but very long climb at the beginning that will test your cardio. If it was a longer trail I would rate it 5 stars. Review: Hit the trails off the Fossil Flat trail head. Got fairly far into trails then we kind of got lost looking for the other side of the trail after getting into Lee Creek creek bed. That was the only bad part of the ride might have missed a few miles because of the miss. Review: I love this trail. Varies in terrain quite a bit. Long, rocky climbs, one exceptionally long decent, fast flowy singletrack on a narrow trail. Can be a little technical in spots but nothing too intense. Review: This is a good trail for new riders to start out on, but it is a bit more challenging than other local rides like Lake Fayetteville. Much of the trail is gravelly with large cobblestones, making it fairly bumpy. When the leaves fall, the leaf litter can make traction difficult, so have some good knobbies. Newbies may find themselves walking a lot of the hills until they grow in strength, endurance, and technical skill. The second half of the trail is a bit easier in terms of surface conditions, but there are a few good climbs and a section of singletrack over a steep hill into the stream. It's not too bad for beginners, but when in doubt - walk. The "gravity cavity" can look intimidating, especially since there's a rock you have to navigate around as you drop into it, but once you get the guts to do it it's a fun highlight on the path. There are some shaley areas near the walk-in campground that look like the path is wet and slick, but it's just the sun shining off of the shale. Definitely get a map. There are a couple of places where the trail splits and it can get confusing. The park service's website has a map, but it's not very good. There are other sites out there where you can get a map if you search in Google and aren't wanting to pay for membership here. If you're not good at following your nose, it would be best to ride with a group the first couple of times. Fossil Flats MTB Trail 4.00 out of 5 based on 8 ratings. 8 user reviews.